Its light straw color offers a nice bouquet and a smell of toasted almonds, candied yellow fruit and biscuit. As for the taste, this champagne has typed a nice balance, a beautiful envelope and roundness. It is frank, elegant and spacious with a nice lie on thin melted and creamy bubbles. Lovely wine. In 2009 the seat of the House Jacquart moved into the former hotel of Brimont, built by architect Paul Blondel at the request of André Ruinart of Brimont. 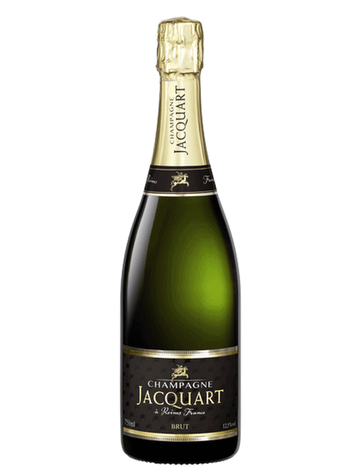 Founded in 1962 in Reims, Jacquart is a cooperative of 1,800 members. The estate is spread over 2600 hectares mainly classified as Premiers Crus and Grands Crus. Terroir : 350 hectares are dedicated to Jacquart Champagnes with over 60 wines distributed in the Côte des Blancs, Reims Mountain, the Valley of the Marne and the Côte des Bar. Viticulture: The grapes are carefully sorted and hand picked at ideal ripeness of the grapes. Vinification: The first alcoholic fermentation is carried out in temperature-controlled vats, followed by malolactic fermentation. Bottled, the wine will start his second alcoholic fermentation and will then rest slowly on the lees for 3 years, thus making a more pronounced maturity.